• achieving “best practice” across all activities that meet both business and customer needs. • developing employee skills to meet the challenges of a constantly changing industry through personal development and the implementation of effective training. • continuous improvement of what we do. EA Group are an NSI Gold accredited company. Reputation is an all important factor in choosing any supplier, not least in the security and access control industry, and in this sector NSI Gold is the highest standard any company can achieve. 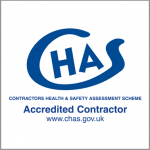 EA Group have been audited and accredited with CHAS, the Contractors Health and Safety Assessment Scheme. CHAS is a founding SSIP (Safety Schemes In Procurement) member. The standard is based around the principles of customer satisfaction, continual improvement and the development of a process based quality management system. In July 2008 following an assessment by an independent body, EA Group (UK) Limited has been awarded ISO 14001 certification. ISO27001 is the new name for BS 7799. It is an internationally-recognised certificate for evaluating how an organisation securely manages its information and data. ADSA was formed for the purpose of ensuring that its member companies offered superior levels of safety in the supply, installation and maintenance of automatic doors. All of EA-Group's engineering staff are CSCS approved skilled contractors. CSCS is has become the industry standard and it is supported by organisations such as the Major Contractors Group (MCG).